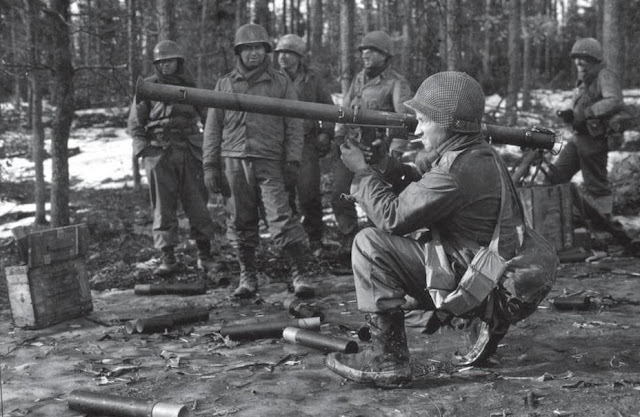 The American "Bazooka" M1 anti-tank rocket launcher is one of the most famous weapons of WWII. Despite its primitive design, it was a very effective anti-tank weapon, which was imitated by the Germans. The Panzerschreck was based on a captured Bazooka. The creation of RPGs became possible via a combination of two technologies, which arose in the early 1940s: HEAT warheads and solid fuel rockets. 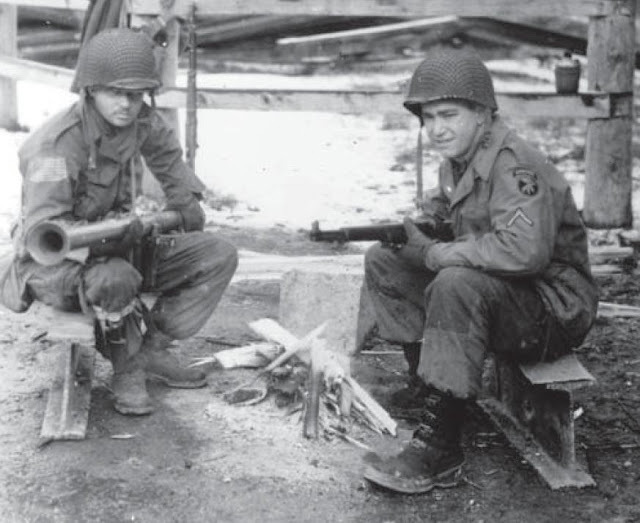 The American infantry adopted the M9 HEAT rifle grenade in Jarnuary of 1941. It was fired from a standard Springfield M1903 rifle, equipped with a special attachment. This weapon could penetrate 32 mm of armour. The more powerful M10 grenade appeared in November of that same year. It could penetrate 50 mm of armour, but was too heavy to be used with a rifle. At first, the Americans tried to turn it from a rifle grenade into a machinegun grenade, firing it from the .50 cal M2HB machinegun, but the recoil still proved excessive. American engineers also experimented with the 13.97 mm Boys rifle and a special 15.24 mm anti-tank rifle, but in every case the grenade threatened to damage the weapon and injure the user. The solution was found by Colonel Leslie Skinner, who worked on rocket ammunition at the Aberdeen Proving Grounds since the early 1930s. He proposed equipping the M10 grenade with a rocket, thus solving the issue of recoil. Captain E. Yule with a prototype T1 launcher. The rocket was fired from a simple tube launcher, 60 mm in caliber, which was assembled by Skinner's assistant, Captain Edward Yule. General Electric received an order for 5000 launchers and 25,000 grenades on May 19th, 1942, and the first batch was ready on June 24th. The launcher was accepted into service under the name M1 Antitank Rocket Launcher, an the grenade received the index M6. 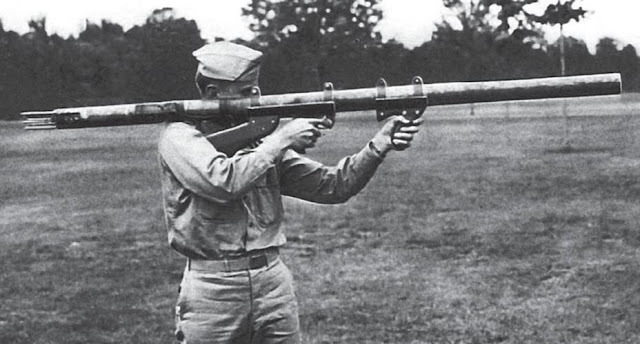 The M1 was quickly nicknamed "Bazooka", due a similarity with the musical instrument invented by Bob Burns. 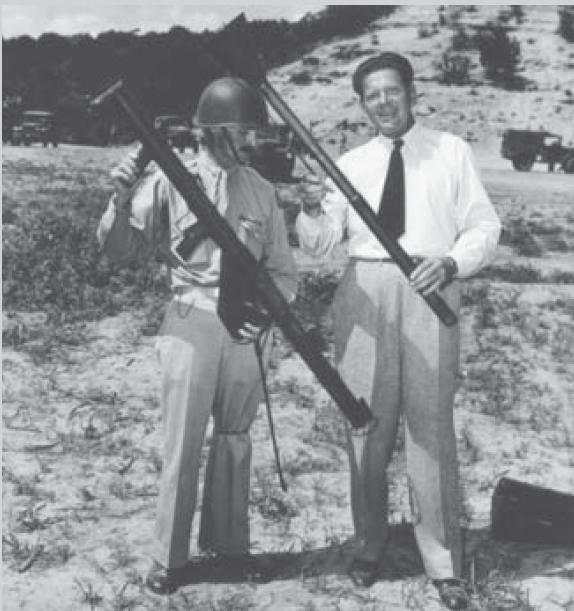 Bob Burns with his Bazooka and a US Army officer with an M1. The M1 rocket launcher consisted of a steel pipe with thin walls, open from both sides. All other components were attached to this pipe: the sights, the front handle, the pistol grip, the shoulder stock, the safety mechanism, and the guard rail around the rear opening. The firing mechanism was electric, powered by a battery, installed inside the wooden shoulder stock. A slot for a second spare battery was located next to it. An indicator light was located on the left side of the stock. When the trigger was pressed, it indicated the function of the battery and electric circuit. One of the contacts of the battery was connected to the ground (the pipe), the other was connected to the rocket's contact (through the safety and trigger mechanisms). The safety mechanism was located in a small box on top of the rear part of the barrel. It consisted of a contact rod, connected to the safety switch. After loading a rocket, the loader moved the switch up, the contact rod moved down, and made contact with the grenade's contact ring. When the trigger was pressed, the circuit was closed, and the rocket engine's gunpowder charge was ignited. After the rocket left the barrel, the contact rod was lifted by a spring, once again activating the safety. The rear of the launcher contained a bracket that held the rocket in place and ensured that the ground connected to one of the contacts on the rocket. The sights on the M1 were convenient to use by left or right handed shooters. The rear sight was movable, and could be flipped to the right or left side of the barrel. In the front, there were two beads, one on each side. The sights were marked for ranges up to 200 yards (183 m). The M6 rocket consisted of a HEAT warhead and a gunpowder rocket engine. The contact detonator was located in between the engine and the warhead. Due to the relatively low velocity of the grenade, it had to be very sensitive, and was thus equipped with a transport safety: a pin, which was removed by the loader before the rocket was loaded. Six stabilizer fins were attached to the engine. Each fin had a slot for the bracket. One of the electric contacts was connected to one of the fins, the other to the contact ring on the ballistic cap, and then to the safety mechanism rod. The M1 rocket launcher turned out to be simple and cheap, which allowed it to be mass produced. The American industry put out 112,790 rocket launchers. However, it was not devoid of shortcomings. The most important one was failures of the firing mechanism. 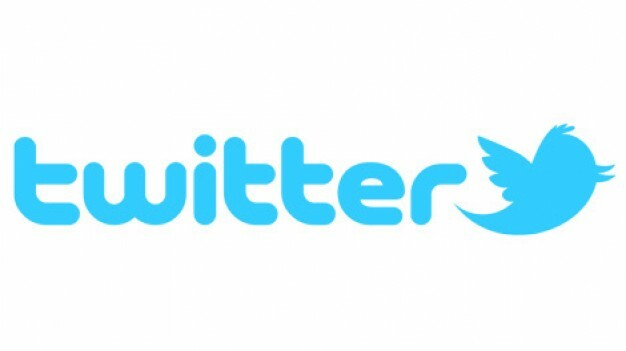 In order to resolve these issues, designers tried to simplify the launcher further. The safety device was removed, and replaced with an in insulated shroud with spring-loaded contacts. The front grip was removed, and the sights were also replaced. Now, they only allowed for fire from the right shoulder (the rear sights were fixed). The front sight was marked for ranges of 100, 200, and 300 yards. Finally, a small round mesh shield was installed to protect the shooter from the exhaust gases. This variant was standardized under the index M1A1. Compared to the first model, half as many were produced: 59,932 units. 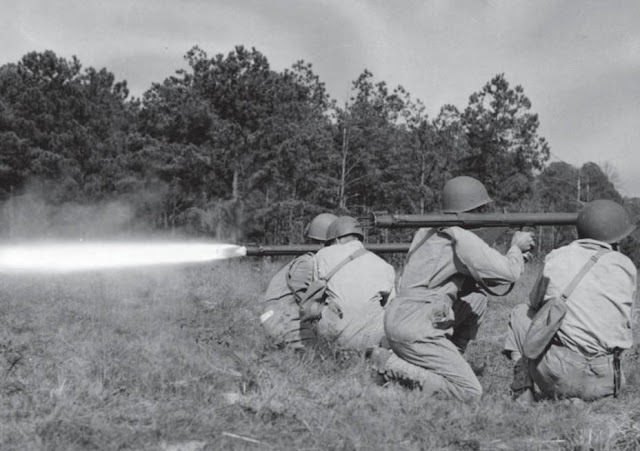 M1A1 Bazooka training at Fort Benning, September 1943. The M9 rocket launcher, appearing in October of 1943, was a more thorough modernization. It had a longer barrel (1500 mm vs 1380), which allowed the removal of the front mesh shield. Now, the gunpowder charge burned up completely while still in the barrel. To make the weapon easier to transport, it could be disassembled. The rear part of the barrel, with the guard rail, contact shroud, and retaining bracket was the same as on the M1A1. The trigger mechanism was radically altered. Now, instead of a battery, an electromagnetic generator (magneto) was used, which activated when the trigger was pressed. The M9A1 variant entered production in June of 1944. It had an improved connection between the front and rear parts of the barrel, a reinforced rear part of the pipe (wrapped in wire), and an optical sight (after September of 1944). In total, 26,987 M9 and 277,819 M9A1 rocket launchers were produced. An illustration of the differences between the M1A1 and M9 designs. The last variant of the bazooka was the M18, which had an aluminium alloy barrel. Thanks to this, the weapon's mass decreased from 7.2 to 4.8 kg. The M18 was accepted into service in April of 1945, but production stopped after only 500 units, since the war was nearly over. Nevertheless, the M18 saw combat. 350 units were sent to the Philippines and Okinawa to be tested in combat. In parallel, the ammunition was also improving. The M6A1 and M6A2 had altered fuses (adapted for the M1A1 and M9), and modified fins. The M6A3 received a hemispherical ballistic cap instead of a conical one, as well as an improved M400 detonator with an additional safety (a spring that blocked the striker and only freed it after the rocket left the barrel). The M6A3's warhead contained 230 g of pentolite, and the rocket was propelled by 65 g of gunpowder. The penetration of the M6A3 increased to 100 mm (previous rockets had 75 mm). M7, M7A1, M7A2, and M7A3 rockets were used for training. These grenades were identical to real ones, but had inert warheads. The M9 and M9A1 received an incendiary-smoke M10 grenade, loaded with 400 g of white phosphorous. In addition to generating smoke, it could be used to attack the enemy in buildings and field fortifications. In total, 12,996,000 HEAT rockets and 2,607,000 smoke rockets were built. 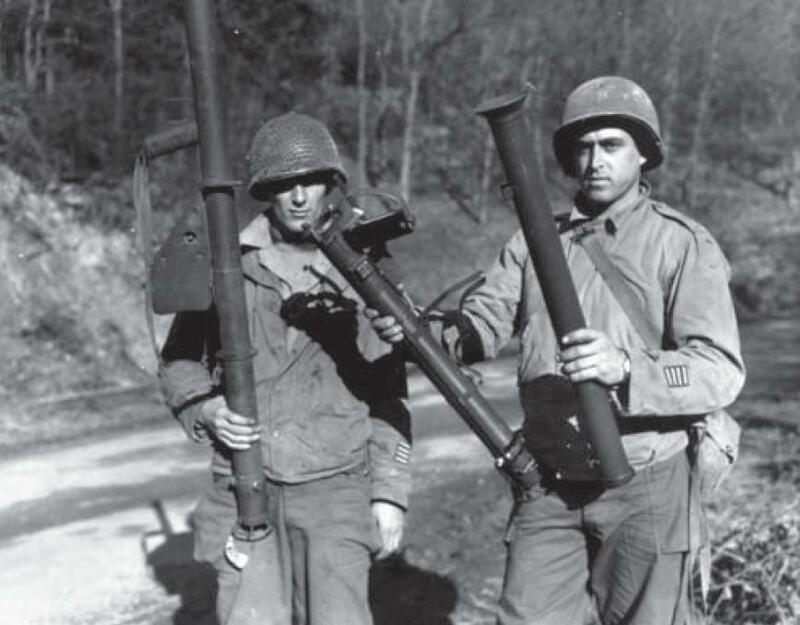 Most of the first batch of M1 rocket launchers was sent to USA's allies, which desperately needed anti-tank weapons. Great Britain received 600 units in September of 1942. The launchers were sent to Suez, where they were stored in a warehouse. The British did not consider it likely that an infantryman would be able to get within 200 yards of an enemy tank in the desert. Later, Great Britain received 1500 more bazookas, and passed them onto the French resistance. The USSR received 3000 launchers and 8500 rockets. The results of the trials were unsatisfactory. The Soviet side remarked on the low penetration (50-55 mm, a third less than claimed in the American specification), low precision at a range of over 50 meters, flame and smoke that revealed the shooter's position, and unstable burning of the gunpowder charge at low temperatures. The USSR declined to order additional bazookas and continued to use 14.5 mm PTRD and PTRS rifles, even though they were larger than the bazooka and did not penetrate as much armour. During WWII, the Free French (11,350 units, plus 2616 launchers passed onto the resistance), Brazil (2876), China (2018) and Canada (177) received bazookas. 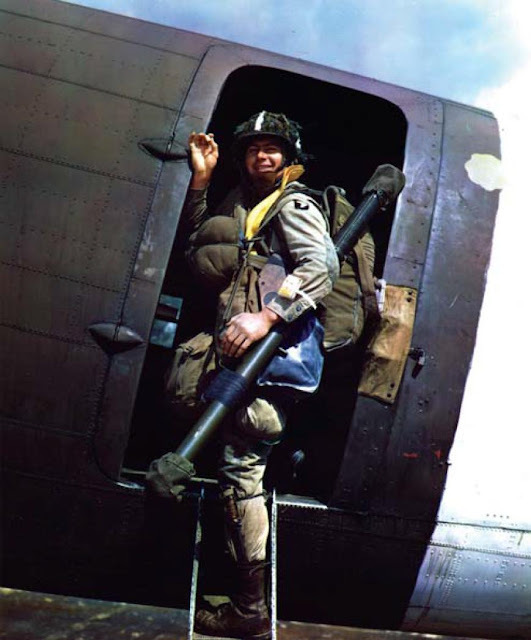 The US Army first used the bazooka during Operation Torch, the landing in North Africa, which started on November 8th, 1942. Interestingly enough, not a single unit participating in the operation was equipped with these rocket launchers. Quartermasters, picking apart the latest shipment of cargo, came across a crate with an unfamiliar label: "Launcher, rocket, antitank, 2,36-in, M1". The word "antitank" piqued their interest. After opening one up, the officers saw six strange pipes. After digging around, crates with M6 rockets were discovered, but instructions on using the latter were completely absent. This did not stop several units from using them anyway. Cases of the rockets being used were already recorded in November of 1942, against French units that continued to resist. Most units received bazookas late. For instance, motorized infantry of the 1st Armored Division received its first rocket launchers in late December of 1942, and the 34th Infantry Division had to wait until February 13th, 1943, right on the eve of the German offensive at Kasserine Pass. Naturally, the soldiers did not have time to master this new weapon. The Germans captured a number of these launchers, and used them under the name Raketenpanzerbüsche (R.PzB.) 788(a). These trophies inspired the Germans to develop their own anti-tank rocket launcher, the Panzerschreck. The biggest difference was the 88 mm caliber, which led to improved penetration. 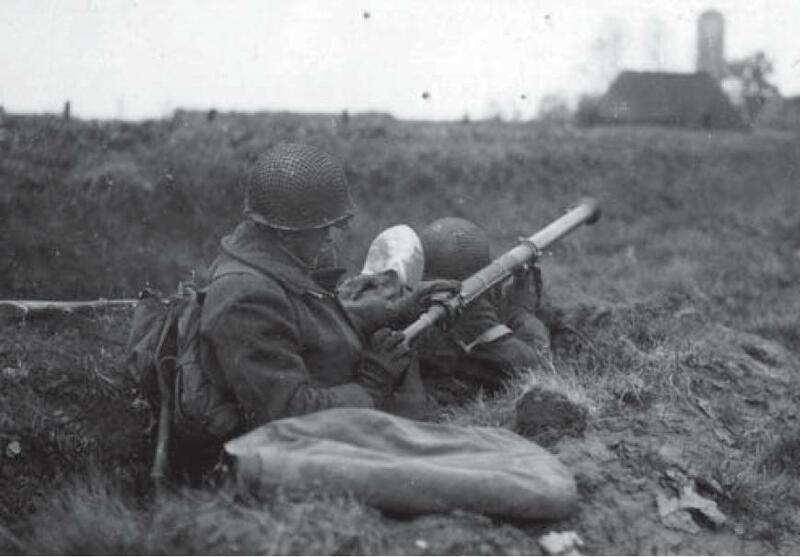 American infantry units received the bazookas as standard equipment only starting in March of 1943, several months after their combat debut. Each infantry company received three launchers, belonging to the heavy weapons section. There were no permanent crews. Each squad was to have two riflemen trained in the use of the launcher, and the bazookas were issued when necessary. Another seven bazookas were kept in the heavy weapons company of the battalion, and eight in the HQ company. An infantry battalion possessed 24 bazookas, and a regiment had 93. In February of 1944, the number of bazookas was increased to 8 per infantry company, but there were still no permanent crews. A crew of two was needed to use the bazooka. 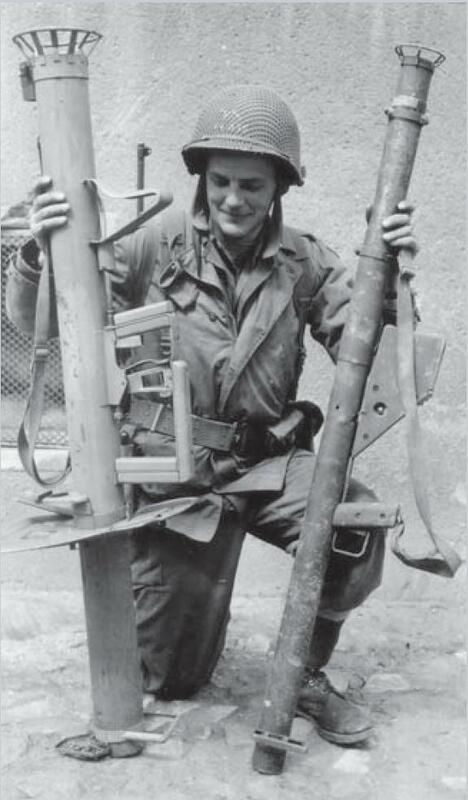 Airborne companies were the first to use M9 launchers (the long M1 and M1A1 were uncomfortable for the paratroopers), with four RPGs: one in the HQ and one in each platoon. In practice, company commanders concentrated their four bazooka crews under their direct command. Glider companies had more bazookas: 5-6 launchers. The first instance of a dedicated bazooka crew was in the Rangers, which had one RPG team per platoon. Infantry units only received dedicated teams in 1948, when a heavy weapons squad was added to each infantry platoon, which included a heavy machinegun and an RPG team (gunner, loader, and two ammunition carriers). Soldiers from the 17th Airborne Division with M9 bazookas. France, January 1945. A large amount of bazookas was present in other units. For example, each squadron of 105 and 155 mm howitzers in an infantry division was issued 40 RPGs according to TO&E issued in March of 1943. Marines had their own methods of using the bazooka. The main targets of bazookas in the Pacific were fortifications, not tanks, which were present in very small amounts. The launchers were concentrated at the battalion level, in assault platoons. This platoon contained three sections of two squads each. Each squad consisted of seven me: the commander, the bazooka team (two men), the flamethrower team (two men) and two engineers with explosives. At the start of Operation Husky (landing in Sicily in July of 1943), the American units had already mastered the bazooka. Thanks to bazookas, the Americans managed to repel German and Italian tank counterattacks on the foothold at Gela. A real appreciation for bazookas was developed during Operation Shingle, the landing on the mainland, which began on September 9th, 1943. The forces that landed at Salerno were immediately attacked by the German 16th Tank Division, but the Americans managed to stand their ground thanks to skillful use of artillery and bazookas. In these battles, the bazooka gained its reputation as an excellent defensive weapon. Due to its great length, the M1A1 was uncomfortable for airborne troops. Old model bazookas, the M1 and M1A1, were still dominant at the time of the Normandy landings in June of 1944. Even paratoopers landed with these awkward long tubes. The more compact M9 saw its first battles during the landing in southern France in August of 1944. Bazooka operator with an M9 launcher. The bazooka, created in the shadow of "tank terror", was used in different conditions here. The Wehrmacht had no large armoured units in Normandy and in southern France in the summer of 1944, and the bazookas were generally used to destroy German strongholds. When M9A1 launchers were issued in the second half of 1944, commanders generally kept their old M1A1s. As a result, the number of RPGs was greater than authorized. Often, an infantry battalion would have 40 bazookas or more. 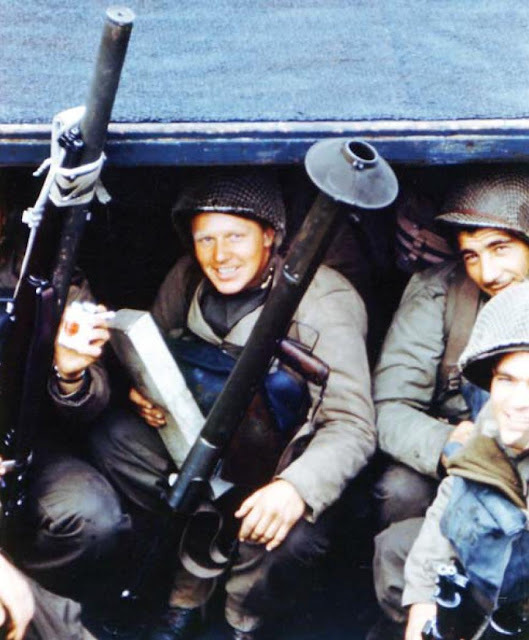 Soldiers of an assault team from the 2nd Ranger Battalion with M1A1 launchers on board a landing craft before the Normandy landings. The first encounter of Americans with a large amount of enemy tanks occurred on July 11th, 1944, near the river Vire. The attack of the German Panzer Lehr division was deflected, in part, by skillful use of M10 tank destroyers. As for the bazooka, it turned out to be worthless against the front armour of Panther and PzIV Ausf. H and J tanks. The next large tank attack took place on the night of August 6th to 7th near Martin. 120 tanks and 32 SPGs took part. The biggest contribution to the defense was by 76 mm guns and field artillery. The bazooka's contribution was minimal. For instance, the 30th Infantry Division reported the destruction of 69 German tanks, and only 10 were claimed by bazookas. Tanks could only be successfully penetrated in the sides and the rear. Normandy's bocages often helped achieve this. The number of bazookas in Western Europe grew constantly. In June of 1944, only 35,000 units were available, but this number reached 93,000 units by the end of April of 1945. The consumption of bazooka ammunition reached 200,000 rockets per month during the most heated battles (December 1944-February 1945). Even though first generation RPGs had a number of drawbacks, this did not prevent Dwight Eisenhower from responding "the Bazooka, the Jeep, the atomic bomb, and the C-47" when asked which weapons contributed the most to victory. Original article by Andrei Haruk. Just a comment on 'the bazooka...was worthless against the front armor of the Panther and PzIV.."
There was an instance, I recall, in the Ardennes Offensive where a US infantryman, who suddenly found himself face to face unexpectedly with a Panther, shot a bazooka and knocked it out...he managed a lucky shot where the round deflected downwards off the mantlet armor and penetrated the turret ring/top deck armor. I say this just because you always have people on these forums who drag out similar 1:100 or 1:1000 chances as "proof" that "X weapon can take out Y tank". Yes, in war anything can and does happen, but you have to recognize what is and isn't a high probably kill. Yup, the British ended up pulling off that stunt with 75 mm guns against both the Panther and Tiger in trials. They still didn't feel very confident in the gun's ability to engage these tanks from the front, though.